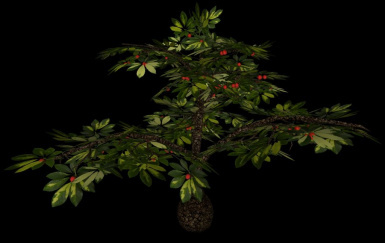 A replacer for the comberry bush with real 3D branches and berries. 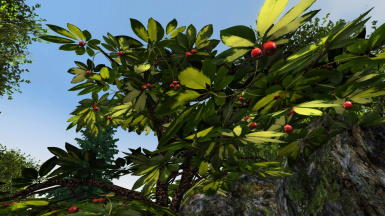 Darkened berry and leaves textures and adjusted alpha masks to reduce glowing edges around leaves when MGE XE shadows fall on them. New mesh and textures for the comberry ingredient! This is a replacer for the comberry bush and ingredient in "The Elder Scrolls 3: Morrowind". The original model was not very detailed and had very low-res textures, but I was unable to find a replacer that I really liked. So I decided to make my own. 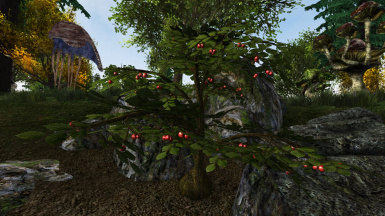 This is a completely remodeled mesh with real 3D branches and 3D berries with reflection maps. Additionally, there are a matching new mesh and textures for the associated alchemy ingredient. All textures made by me using free images from cgtextures.com and burningwell.org. I decided to give it a tropical appearance, but I have included optional textures that are more similar to the original look. Also, bark textures from other replacers can be used with my mesh. This is my first published mod for TES3: Morrowind. Copy the "meshes" and "textures" folders into your "...Morrowind\Data Files" folder. Overwrite existing files. My new meshes are only compatible with my new textures, you should not use other textures which have not been made for these meshes. The bark texture is an exception, it can be substituted by other seamless textures. This is a simple replacer without an .esp file. If you like the original look more than my tropical version, copy the textures from the "Vanilla Style Textures" folder into your "...Data Files\Textures" and overwrite the existing files. The "Extras" folder contains a harvested mesh to be used with Graphic Herbalism. There is no harvested texture as the berrys are 3D objects which have simply been removed for the harvested version. 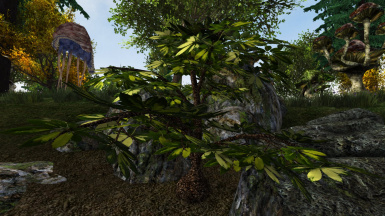 To install the Graphic Herbalism mesh, simply copy the "meshes" folder within the "Extras" Folder to "...Morrowind\Data Files" and overwrite the existing file. It is highly recommended to use the "Bump/reflect Map local lighting" fix from Morrowind Code Patch with this mod. It doesn't use bump maps at the moment, but without the fix the reflection map on the berries may appear overly bright. Remove the files flora_comberry_01.nif in "Data Files\Meshes\f", ingred_comberry_01.nif in "Data Files\Meshes\n" as well as berry.dds, Tx_comberry01.dds, Tx_comberry_02.dds, and b_ref.dds in "Data Files\Textures" in order to restore the original meshes and textures. To remove the Graphic Herbalism mesh, replace the file Comberry_01_P.nif in "DataFiles\Meshes\Gherb" with the original mod file. This will conflict with any other mod that changes the mesh or textures of the comberry bush or ingredient. As I use the original file names for my meshes and textures, it is possible that they get overwritten by other replacers or mods. If this happens, just reinstall my meshes and textures. This will not affect your savegames!